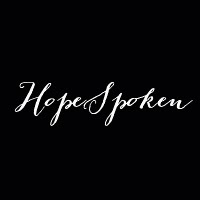 "Hope Spoken is a women's conference where we all can come to know Jesus more, and make Him known in our lives. Our conference will be filled with stories. Stories of Christ in each of our lives, and how we can use these stories for His glory. This is a weekend to rest and feel His love, to lay burdens and hurts down and feel His grace. We want to let women know that they are enough, to encourage women to use their passions, their words, and their creativity for the Lord. We, above all else, want to glorify Jesus' name and share the hope we have in Him." I'm excited to be a part of this conference and will be there as one of the small group leaders for the weekend! I believe that right now, tickets are sold out, but they are looking at adding more soon, so if you are interested in going, keep an eye on the website here. I'm Laura. Married to Brandon. We will be married 9 years this coming November! Together we have planted a church here on the North West side of San Antonio and LOVING it. I love my family. They are my number 1 priority. I love the Lord and I love serving along side my husband to see God's kingdom advanced. I have a huge, soft heart for people in general. I own a little online shop that I love and I also really love Target, new notebooks, candles, and fresh flowers. Hmm....uncertainty, I guess? Not knowing what to expect or how to plan. I'm such a planner and I like to know what to expect. But I have come to learn that it is in these situations of uncertainty that God shows up big in my life and uses me, speaks to me and enlightens me in a whole new way. So while I'm nervous about it, I'm also super excited! While I have "met" so many of the women who will be there through social media, I am most looking forward to truly connecting in person. I can't wait to hear their stories and to talk face to face. I can't wait for God's glory to be shown and talked about from all kinds of women with all kinds of stories. I really don't think you can beat -in person- connection. I'm a hugger too, so just know if you meet me, I will probably hug you. I can't stand sleeping with socks on. I eat my ice cream with a fork. I am super intrigued and interested in other people. My kids take a bath every.single.day. I really love to dance. I am training for a half marathon. I'm addicted to carbs. I've got a major case of baby fever right now. I do not take myself too seriously and am usually the first person to laugh at myself. Ok so for real, don't make this all about me. Did you link up? Are you going to the conference? Did you not link up? Do you have no clue what linking up means? Are you so confused right now? And also, if you leave me a comment, I almost always reply in the comments, so check back there! Hi Laura! Excited to meet you in March! Hi Amanda!!! Excited to meet you to! I had no idea you were 31! You don't look a day over 21, like you feel :) I sure wish I could attend this. Glory to God for you women! I don't know if I've ever seen a cuter photo than the one of you in this blog post! OMG, you are adorable! Praying you receive all you're hoping for and more from the conference!! Oh thats just way too sweet. Thank you Shannon! i eat ice cream with a fork, too. thought i was the only wierdo ;) can't wait to see you in a few months! Something about spoons....I'm just not a big fan. Can't wait to hug you Aly! I LOVE that you sent the dresses. Blesses my heart so much. My husband and I are praying about a church planting residency program through our local church right now. Super encouraged and intrigued by your guys experience + jumping into the good kingdom stuff! We love it! It's been such a blessing and challenging in the best way! I'd love you to email me if you have any questions at all! I'm finding so many new blogs through the link-up! So excited to find yours :) I'm really excited to make some connections with other ladies and see how God brings us all together and where He will take us all after we leave! Hi Julia! So cool you're from SA! What part?! I LOVE your kids' names...and please tell me your hair secret-it's gorgeous! God bless you and your hubs in the ministry-look forward to reading more and meeting you at the conference! Yes and Yes. Love your heart from community and connection! That's one of the things I am so looking forward to for this weekend. Target+new notebooks+candles + fresh flowers...you are speaking my language!